Patti wrote: I found a link to the text. The page is formatted poorly, but if you scroll almost to the bottom you'll find the chapter I mentioned above at the number "161"
"Indeed, man is to be ranked among the highly specialized primates, along with Tarsius, Ateles and Hylobates each having its own kind of specialization, in the instance of Hylobates, at least, representing departures from primitiveness which are carried further than in man and in directions which are in part peculiar to the genus." PS. 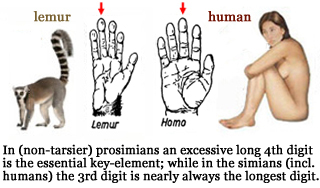 I recognize how this comment in the perspective of the dermatoglyphics also is relevant for the other hand characteristics of these primate species, because in my primate hand study I found that the Tarsius (= the highest evolved prosimian) and Hylobates (= gibbons) happen to be two of the three primates species that have a HIGHER 2D:4D digit ratio than us humans! The third primates species is the capuchin monkey (cebus)... which is known for it's relatively high intelligence (capuchins are the only primates that have a higher brain to body index than us humans). PPS. 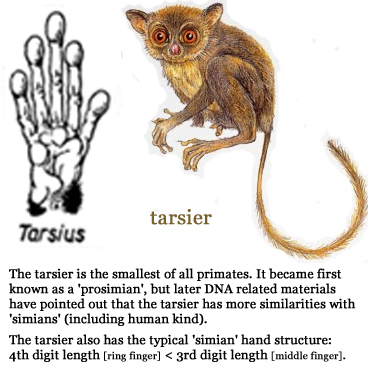 The hand shows that the 'ateles' (= spider monkey) does not really belown to the higher evolved primates... because they have no thumb and their dermatoglyphic pattern index for the hand is actually higher than all non-human apes - so this monkey is probably only listed for their feet... and the picture on page 174 shows for the human species (homo) tat the feet are actually far less relevant than the hands: because all human apes species have a lower pattern index on their feet than us humans! Yes, and those that are more specialized have the more primitive patterns. In eugenics in the late 19th to early 20th century this became an issue as Jews have more whorls and some tried to use the idea of primitive to relate to closer to the apes than other humans. But the fact was that the more specialized primates had the most primitive patterns. Meaning the arches were on the least specialized. Patti wrote: Yes, and those that are more specialized have the more primitive patterns. No Patti... the more primitive primate species display the more primitive patterns (such as: high pattern intensity, more whorls + low 2D:4D ratios). And the more specialized primate species - such has the Tarsius, Ateles and Hylobates - exhibit more of the less primitive patterns (such as: low pattern intensity, less whorls + high 2D:4D digit ratios). "Indeed, man is to be ranked among the highly specialized primates, along with Tarsius, Ateles and Hylobates each having its own kind of specialization..."